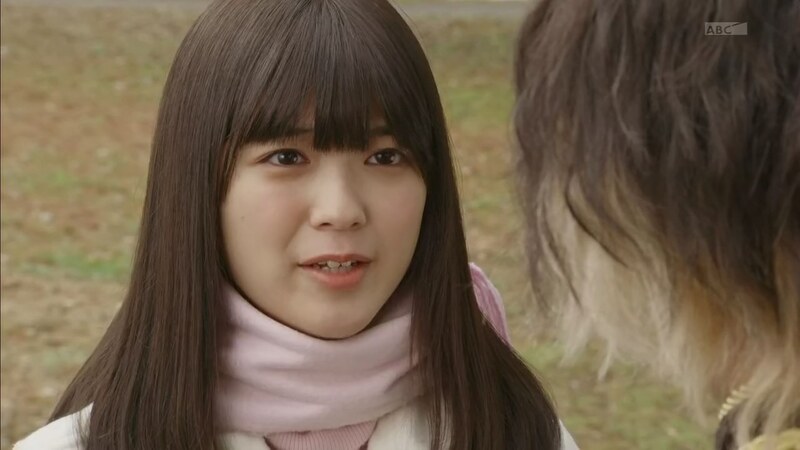 Recap: Kamen Rider Ghost, Episode 19 – Explosion! Paint From Your Heart! Alain is looking out over the city and says this will soon become part of their world. He waves Makoto in and says he will no longer have Takeru be a bad influence on him since they are now one. 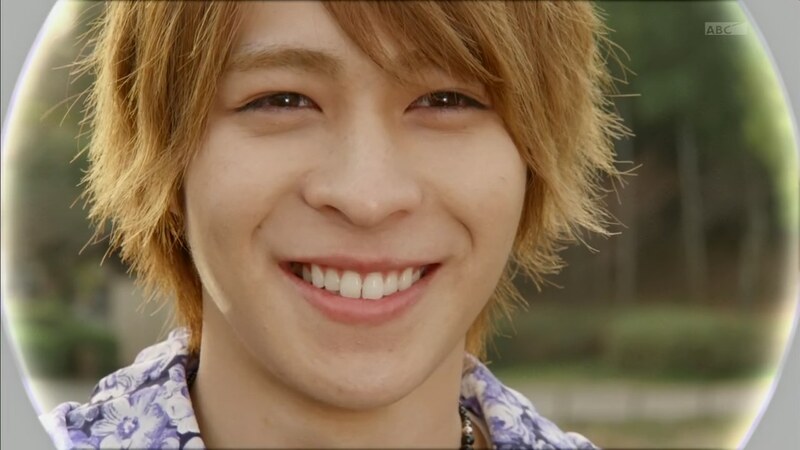 But Alain remembers Takeru’s words about their friendship. Perfect friends? Alain looks up at the sun in the sky. In the Ganma World, Adel orders Igor to move on to the next plan. 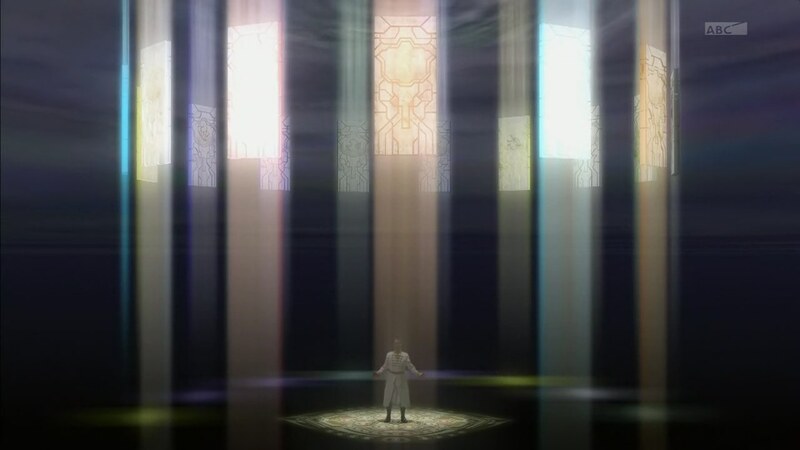 He expresses his wish for Igor to be successful so he can become the next magistrate. As Igor leaves, Adel looks forward to the day he will rule everything. Igor heads into the city to begin the Demia Project. Someone is painting and a building suddenly turns into abstract art. Igor is intrigued by Gazai/Art Supply Ganma ‘s unique ability. Onari is grocery shopping when a tray of apples suddenly turn abstract. But even stranger, he feels something wrong with his head. It also turns abstract! He runs out of the grocery store in horror. Gazai Ganma is disappointed he wasn’t able to finish his painting so he rips it up. Over at the lab, Takeru is also thinking about his exchange with Alain earlier. He vows to show Alain what real friendship is. Akari excitedly shows how the Ganma piece she’s been analyzing is completely incomprehensible. It is not made of anything found on Earth. But she is hopeful that they will eventually find the scientific explanations of the Ganma Eyecon. She thinks Igor’s insistence on a “perfect” Ganma world is impossible. And she definitely will not lose to a KMS (Perfectly Mad Scientist) like Igor. Takeru himself is unsure about what the Ganma World really is. During his visit, it didn’t seem like a place people could live. Akari wonders if Takeru’s strange reset has something to do with the Ganma World. Takeru calls for Grampa Sennin, but Akari instead shines Spider Lantern on Yurusen. He says Gramps is out busy with something. So Takeru asks if he knows anything. Yurusen is of course not one to easily spill the beans. Kanon pops in and Takeru promises to bring Makoto-niichan back. 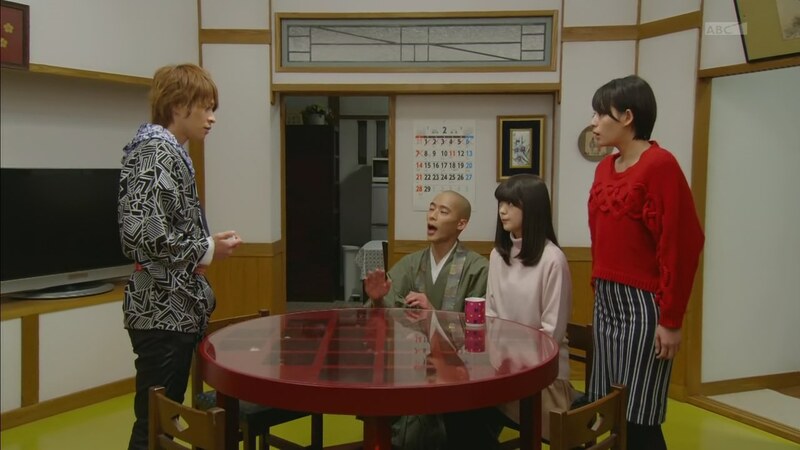 But Onari comes running in to show them his head… which is back to being normal and bald. But back upstairs, Narita and Shibuya show them reports of various things and places turned into abstract paintings. 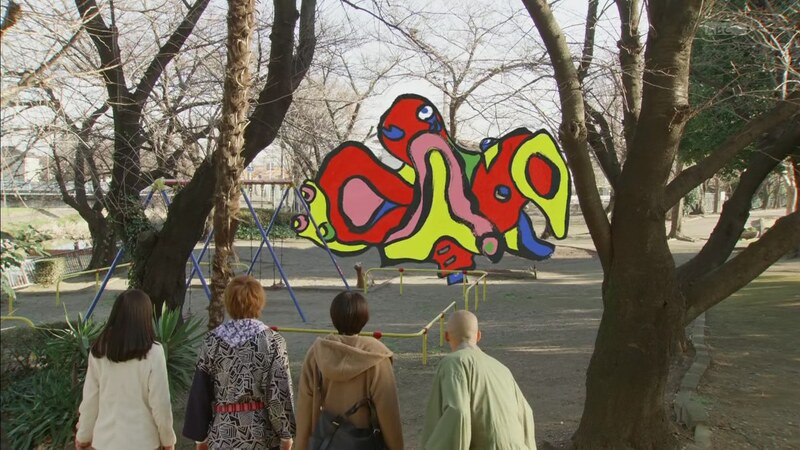 Takeru, Onari, Akari and Kanon head to the playground where the octopus slide is now an abstract octopus painting. 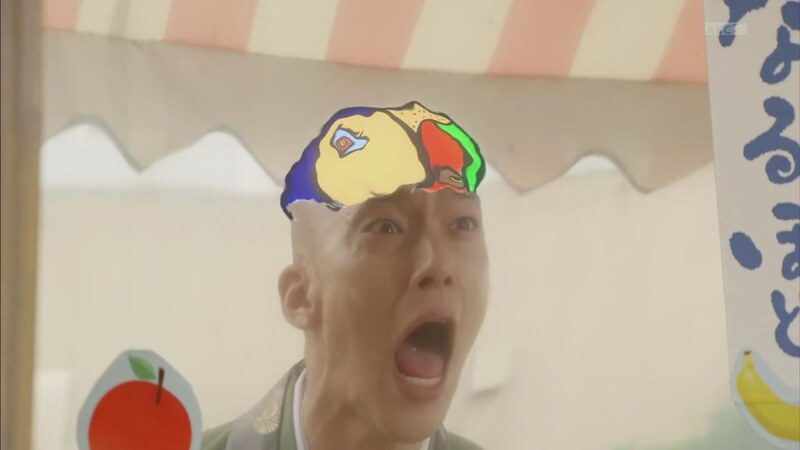 Suddenly, Onari head turns into a painting again. Takeru sees the Ganma is sitting nearby, painting. Takeru asks Gazai Ganma to stop it, but he says he’s inspired and this is his mission. Takeru goes Boost and the Boost hoodie slices Gazai Ganma’s painting in half. Takeru holds Gazai Ganma and promises not to hurt him as long as he stops. 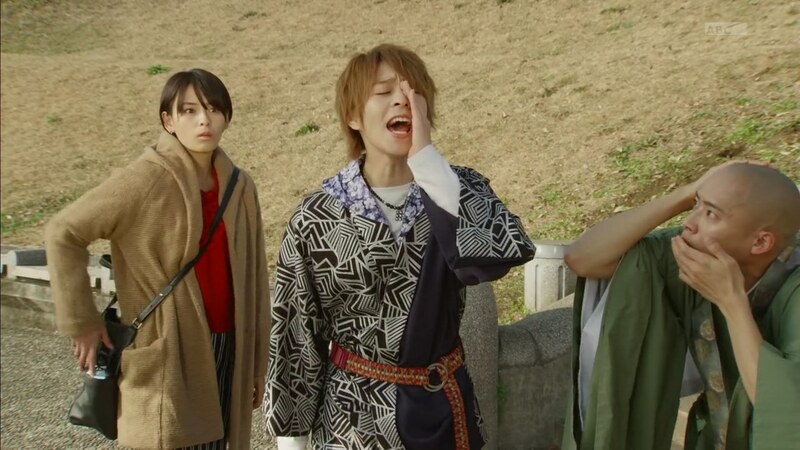 Akari and Onari don’t understand why Takeru won’t just finish him off. But Takeru says this Ganma is different. Gazai Ganma paints Takeru’s drivers and turns it into a painting, but rips the painting anyway to distract them and allow him to run off. Igor is in the abstract building which has turned wavy inside. He continues his plan. He heads into the office of the president of the company. He rips the painting, making the building go back to normal. 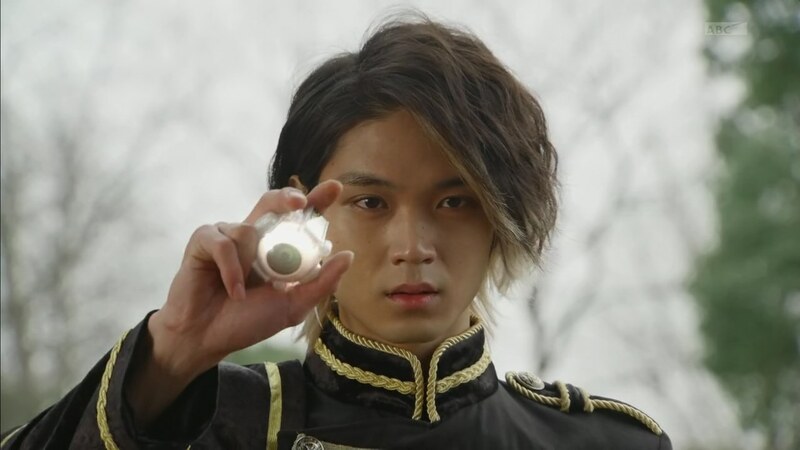 But he then tosses an Eyecon into the guy’s mouth. 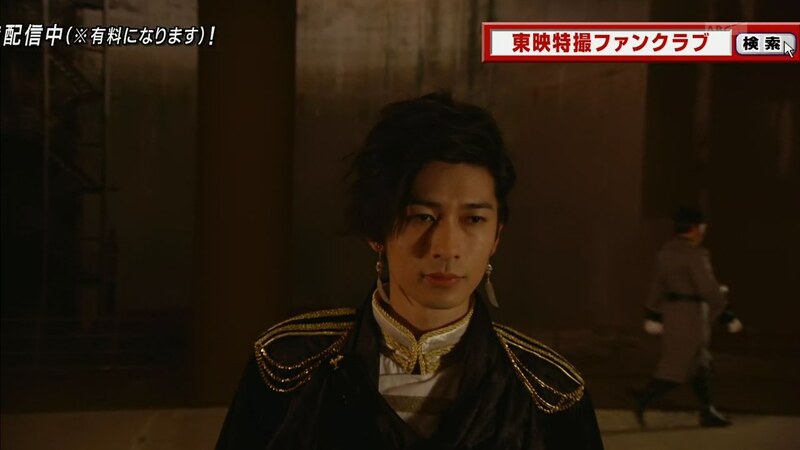 Onari and Akari question Takeru’s decision to go easy on the Ganma, but he insists that maybe there are different kinds of Ganma. Seeing Takeru has to deal with this, she decides to go look for her oniichan on her own. 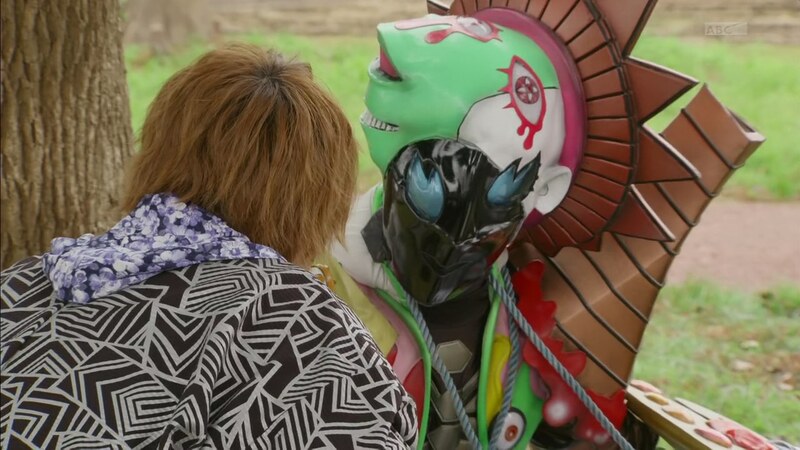 Takeru calls Yurusen who pops in and is again not very helpful in trying to understand the Gazai Ganma. They notice Kanon is gone. Takeru says he’ll look for Kanon while Onari and Akari look for the Ganma. Alain is with Makoto at his usual spot by the water. Alain asks what he likes so much about this place. The sea? The sky? Makoto nods yes. Alain says the other world is better though and Makoto agrees. Alain leaves and heads straight to Grandma Fumi. She greets him as Kanon’s funny boyfriend. Alain asks what a “boyfriend” is. Grandma is just amused by him. She asks if he lives around here, but Alain says he lives in another world. Grandma Fumi wonders if that means he’s a celebrity. Or maybe his father is very rich? Alain says money is meaningless, but his father possesses everything. He is a perfect entity who rules their world. Alain flashes to his father praying for everything that must be done to ensure perfect harmony. Grandma Fumi thinks that’s pretty awesome even though she doesn’t really get what he’s saying. Anyway, he should enjoy some takoyaki. Alain’s eyes widen at the sight. He takes one of the delicious balls, but snaps himself out of it. Kanon appears. He tells her to go home, but she says she’s not leaving his side until she gets her oniichan back. Grandma Fumi screams when the takoyaki turns into a painting. Kanon gets her to safety as Alain confronts Gazai Ganma. Gazai Ganma says the takoyaki was beautiful, he just had to paint it. Takeru comes running and tells Alain not to hurt the Ganma. He again asks Gazai Ganma to stop painting so they can talk. Gazai Ganma says he will not. He is enjoying his painting, especially since he could not do this in the Ganma World. So there were no paintings there? Alain says their world is perfect, so there is no need for something so useless as paintings. Yes, Takeru says, just like Alain and Makoto. 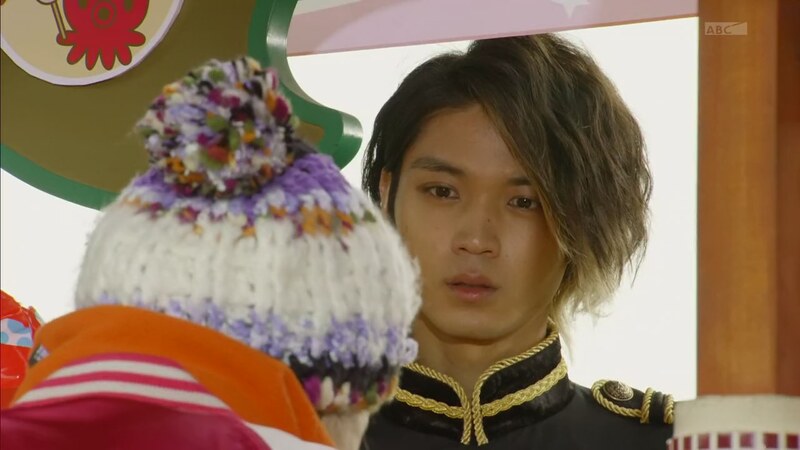 Benkei Eyecon peeks through Takeru’s cloak. Gazai Ganma asks what a “friend” is. Alain will not let Takeru answer that nonsensical question and they both henshin. Kanon tries to get them to stop as Gazai Ganma hides behind a tree. Alain summons Makoto and they tag-team Takeru. Kanon unsuccessfully calls to her oniichan. Takeru questions whether Alain likes Makoto being his friend in this way. Alain orders Makoto to deliver a final strike. But Kanon steps in front of a down Takeru. Alain gets Makoto to hold his fire and eventually whisks themselves away. Igor appears and says the plan is going smoothly. He tells Gazai Ganma it’s time to go, but Gazai Ganma just wants to paint. Igor is shocked. Igor grabs Gazai Ganma and says he needs to be reprogrammed. But Takeru wants to save him and become his friend. Igor says friendship is illogical and is unnecessary in a perfect world. Igor shoves Gazai Ganma to the ground and henshins. Gazai Ganma watches as Takeru goes Benkei and fights Igor while defending his hope to befriend Gazai Ganma who he says has a heart. Takeru manages to send Igor away. But Gazai Ganma has disappeared. Back at the temple, Takeru promises Kanon that they’ll get Makoto back the next time. 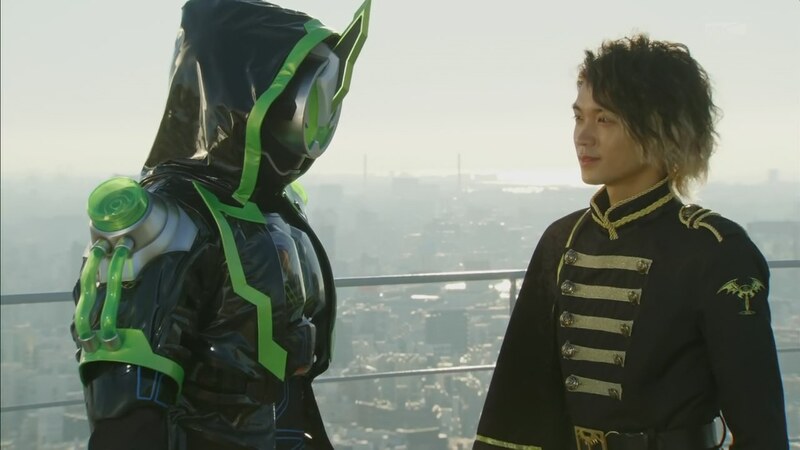 Akari and Onari still question Takeru’s decision to befriend the Gazai Ganma like he wants to befriend Alain. 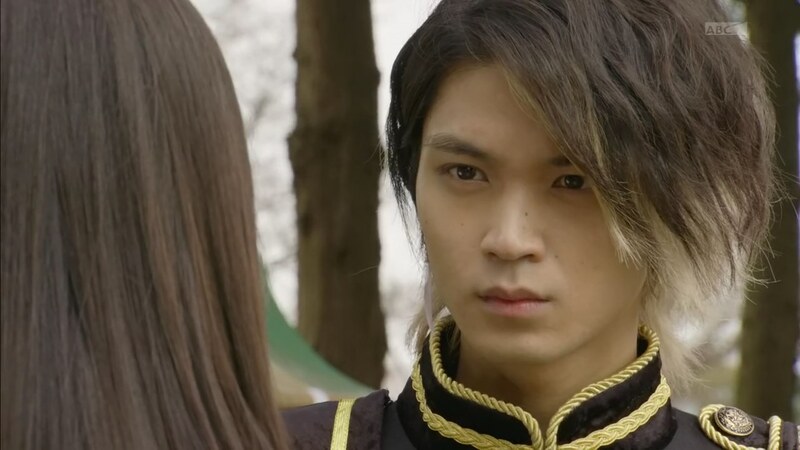 Takeru says he is sure that can happen Suddenly, Benkei takes him into the Eyecon and tells him to consider what others around him say while still following his own path. That will increase his power. Takeru understands. So this was a slower episode than we’ve had. I kinda want to see things move a little faster, if only because I want to see what’s next. But I did enjoy all those scenes basically implying Alain wants to be human. I mean, that’s the direction we’re going in, right? He wants to be friends with a human, he’s crushing on his best friend’s sister, he enjoys the sun and the sky and the birds, he wants to eat takoyaki. I’d actually be disappointed if that’s not where this is heading. They’ve certainly set that possible plot up well. A story can be predictable as long as the journey to the expected point is good. And so far, I like it. With Mr. Art Supply Ganma, I like those one or two-off episodes that give us a friendly MOTW. But I hate when toku takes that sympathetic or friendly MOTWs and then proceeds to kill them. It’s sad and is definitely not that great of a message for the kiddies watching, eh? Hehe. Instead, I wish they’d throw in these kinds of “nice” monsters of the week to help develop the villains and their character(s). It does appear that they’re going to use Gazai Ganma to help fill in and support Alain’s character and his mysterious feelings for humans and the human world. Speaking of Alain, we meet his father who we assume is the king or something. It’ll be interesting to finally learn about what exactly the Ganma are and what their world is really like. We’ll get to why Papa Tenkuuji wanted to link to it later on afterwards. Great to see Grandma Fumi pop up again. But I also hope they give Kanon a little more to do. Though I guess she’ll play into Alain’s story more once they delve deeper. Overall, it was a worklike episode that sets up whatever happens in the next episode. But I do like what we’re getting so far. ← Good ol' Review – Kamen Rider Drive: Surprise Future – Enjoyable Disappointment? Speaking of Alain’s would be former life, this is still one aspect of the story that keeps nagging me. They keep on talking how perfect the Ganma world is but they have yet to actually fill us the audience on why this is supposed to be so. This is really crucial if they want to advance this particular theme for the latter part of the series. And this might be a bit of a spoiler, but it seems that, basing on the magazine scans, Granpa Sage might actually be doing a DJ Sagara, what with him being that mystery guy shown in the preview. I wonder how this would actually play out. Yeah, they definitely need to show what the Ganma World is all about. 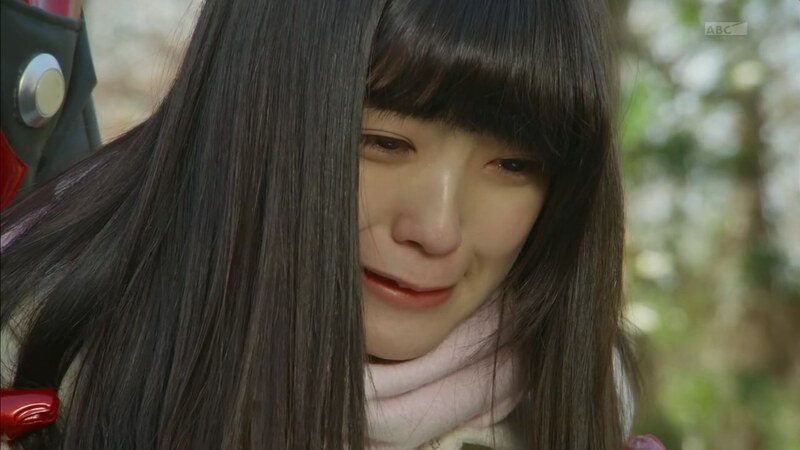 But maybe that will use Makoto to flesh that out, likely when Kanon and Takeru get their oniichan back from Alain. Good point about Chase pretty much being left with nothing to do. Definitely hope it’s different for Alain.